Artabase is a website dedicated to promotion and networking of the arts, on both a local and international scale. Artabase's mission is to provide an accessible, useful insight into the world's art activities. On their website, you can subscribe to arts email lists, and list your arts project and gallery exhibitions. 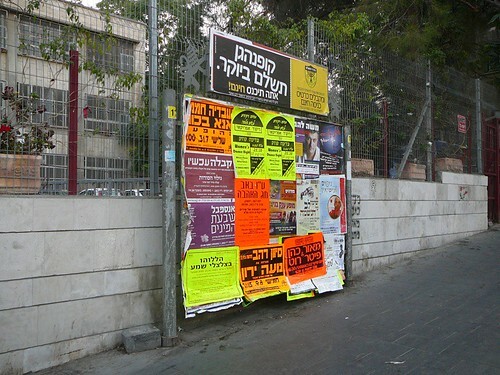 in jerusalem, and even tel aviv there's not much postering going on - on the walls of the buildings. it seems much more controlled. they have these boards up at regular spots around the city. there's a number to call at the top of the board and I've seen the guys swapping the posters each week. so it's a small business for the board holders. similar to the flyer bags in UK. there's a mix of events listed on the boards too. I've seen flyers, with bits of english that I could read, for djs (eg Markey Funk who's cd I bought the other day - a down tempo hip hop / turntablist), plus larger concerts and jazz festivals and book readings / fairs and workshops / lectures. most of the things actually look like they'd be quite interesting if I could read / speak Hebrew!